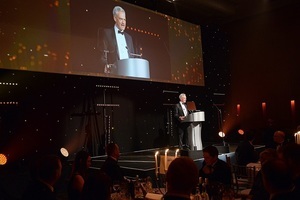 David Peattie, Chief Executive of the Nuclear Decommissioning Authority (NDA), spoke of the need to prioritise skills if the industry was to meet its future challenges. As keynote speaker for both events, David detailed the work taking place within NDA group to ensure a current and future workforce capable of driving forward the nuclear decommissioning industry. We were delighted to support the first Nuclear Skills conference and this year’s Nuclear Skills Awards showcasing the breadth of talent in the nuclear industry. Ensuring we have the right skills in place both now and in the future, is vitally important to the NDA and our mission to clean up the UK’s nuclear sites. Developing young people and talented individuals into tomorrow’s leaders, innovators, engineers and professionals is crucial for the future of our sector and the wider nuclear industry. The events shed light on the skills and expertise in the industry and rightly celebrate the exceptional work of individuals from across the nuclear sector. The skills conference and awards welcomed nuclear leaders, supply chain companies and young people who are currently benefitting from nuclear skills programmes, including apprentices and higher and further leaners. The events were organised by the Nuclear Skills Strategy Group, and NSAN and Cogent Skills respectively. During the skills conference, delegates discussed issues around the Nuclear Sector Deal workforce themes including skills leadership, diversity, subject matter experts, a talent pipeline through apprenticeships and sector transferability. While the awards ceremony saw a new ED&I category, supported by the NDA, highlighting the exceptional work of individuals from the nuclear industry, in the promotion and support of equality, diversity and inclusion. Making our organisations more inclusive is not only the right thing to do, but is crucial if we want to continue to attract, progress and retain talented people with the skills and diverse thinking we need in the years to come. The first Nuclear Skills conference was held at Manchester’s Bridgewater Hall and the 11th UK Nuclear Skills Awards were held at Hilton Hotel, in Manchester.